“It’s live, it’s on the spot and it’s happening" - briefly this is how the whole initiative can be summed up. 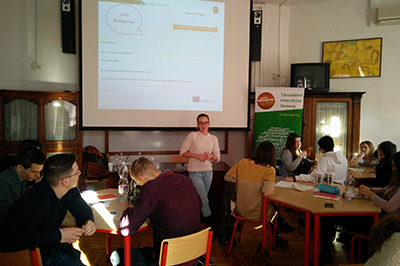 From October until the end of February, JA Hungary travels around Hungary to promote the idea of social enterprises and most importantly the Social Innovation Relay where students can develop their innovative social business concepts. The best 20 teams can connect with Hungarian NN volunteers who help them to develop these concepts into feasible business ideas during the mentorship phase.